This is a tutorial on how to link to only a certain Part of Youtube video from a specific starting point to end point. You may ask why should I link to only a part of a Youtube video? Let's say you were watching a Youtube and found a particular scene amusing and wanted to share just that scene with your friends. Usually, when you share a link, your friends will be forced to see the whole video from beginning to end and they may not have the patience to go to the scene. Sometimes in your blog, you may want to redirect your viewers only to a certain part of a video. You can do all these things using the below method. Go to the video page on Youtube. Copy the entire url from the top. Fill in this form. Any doubts, read this article. Click Get the Code! Your link would be displayed. Just copy and share it. Watch this video, if you have doubts. An explanation of the link that you would get. start=8 is the starting point of your video and this is in seconds. Change this "8" to your value. end=16 is the starting point of your video and this is in seconds. Change this "16" to your value. autoplay=1 will play the video automatically and autoplay=0 means it won't. This is the final link and copy and share this edited link wherever you want. You can test the sample link to get an idea of what we are doing. 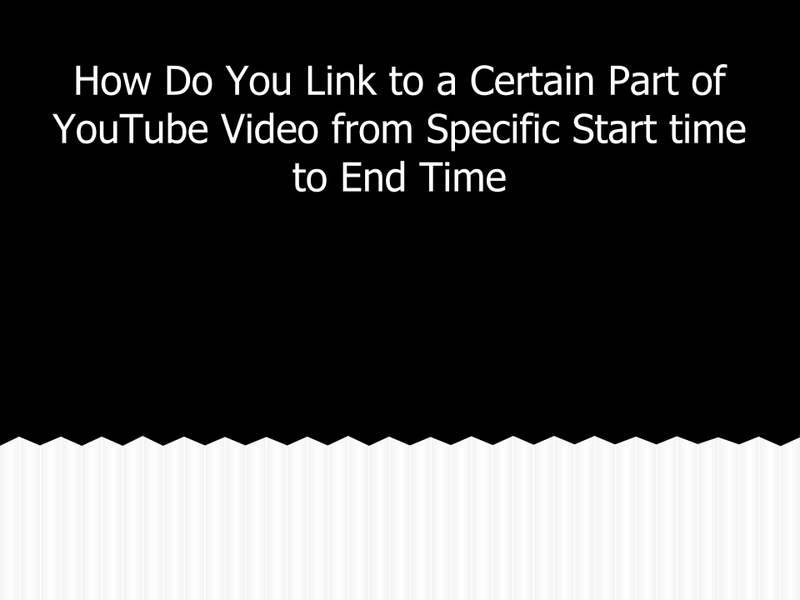 This completes the tutorial on link to only a certain Part of Youtube video from specific start time to end time.